Our final morning in Yellowstone was the coldest by far. We made sure the kids had a good breakfast via the continental breakfast provided by the hotel. 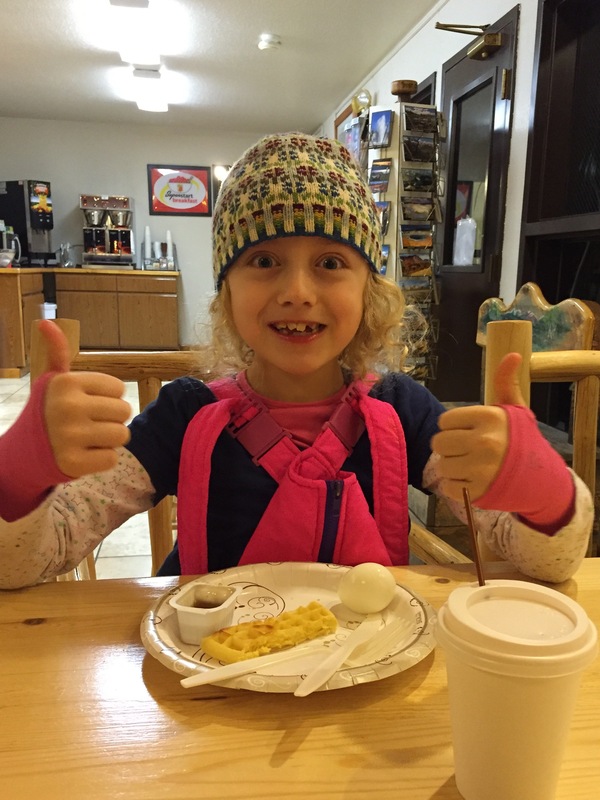 In case you’re wondering, to our kids the hotel continental breakfast was amazing and got 2 thumbs up. With full bellies we made our way back into the park, but with the sun just coming up it was still in the single digits so we opted for a short repeat hike that we’d done one other day which we knew would keep us out of any possible wind and wouldn’t take us far from the car. We revisited the trail along the icy, fast-moving Gardiner River that takes you right up to the confluence with the Boiling River. 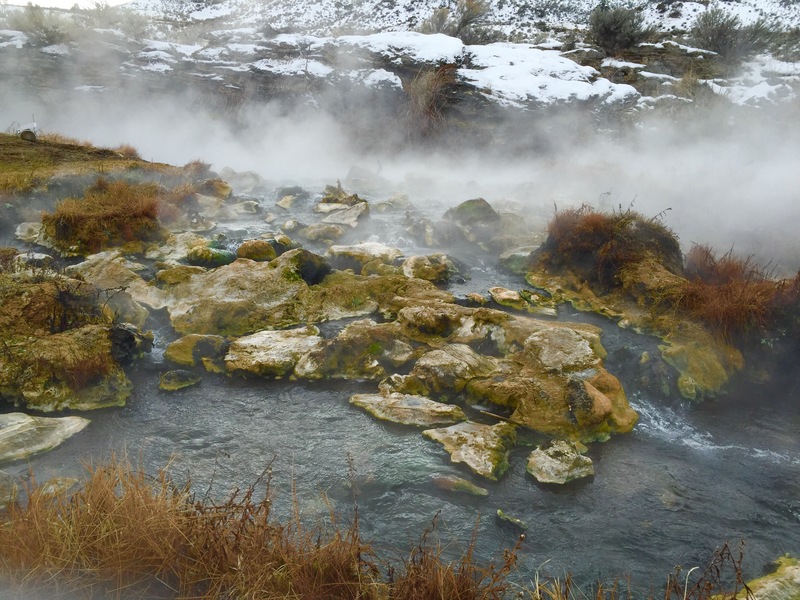 The aptly named Boiling River is fed by Mammoth Hot Springs and while it isn’t literally boiling, it’s very, very hot. Where the two meet, many choose to brave the extreme temps for a soak. We just hiked and reflected on our trip and waited for the sun to make its way over the mountains. With the little American Dipper, dipping away in the very center of the river in this picture. We walked to the end of the trail to get one last look at the Boiling River and all the vivid colors that are present around it. Interrupted only by the American Dippers antagonizing each other and a Belted Kingfisher that flew past, searching the river for food. It was right near this spot that a couple days earlier we saw an snowy-white ermine with his little black-tipped tail run across the road plain as day. It was unbelievable for us because last year in Minnesota we’d tried so hard in vain to catch a glimpse of this little member of the weasel family. And here, in the weird and mysterious and magical world that is Yellowstone, he just scampered across the road in front of us as if it was nothing. And I think that’s the thing about Yellowstone, what I’ve taken away from this adventure. Yellowstone is this place that turns ‘normal’ on its head. It’s a super-volcano in a seemingly random spot. It’s a place where rivers boil and organisms thrive in places you would never expect to find life. It’s a place where huge bison shrink and disappear in mountain forests in the blink of an eye and where wolves bound up steep ridges and have conversations across miles of open valleys. It’s a place where song birds hunt in icy rivers and ermine lope across the road, where our cars share the roads and bridges with bison and coyotes. It’s a place that on the surface is so stable and yet you can feel that deep down, there’s a constant churning within. What struck me most, however, was watching all the animals move across the immense wilderness, this landscape that just goes on forever. It was hard for me to really grasp how these animals know how to survive in such a huge, sometimes harsh place. And as I reflect on these thoughts, I keep coming back to that first view of the wolves as they ambled along their trail traversing that ridge — some walking, some trotting, some playing and frolicking — distinct personalities clear from miles away. It struck me that as long as they were together, this pack of wolves had everything it needed just in having each other. And in that moment I felt a real connection to them because they were not unlike my little family on our little adventure across those 3043.8 miles. Packed with the essentials in our little car, we had our warm coats and the car’s heater for warmth, we had a way to get food, and we had each other. For all the weird, mysterious beauty, for all the churning deep beneath our feet, like the wolves we wake up each day fortunate to have and to be able to rely on each other. It isn’t always easy or simple, but all the rest the world throws at us we can handle as long as we’re together. We left Gardiner well before dawn, bidding farewell to Yellowstone in the darkness with Orion looking down on us. We saw and experienced so much there, but there is so much left in this place to explore and learn that it seemed almost fitting that we should leave it shrouded in darkness, still holding some secrets for us to uncover. 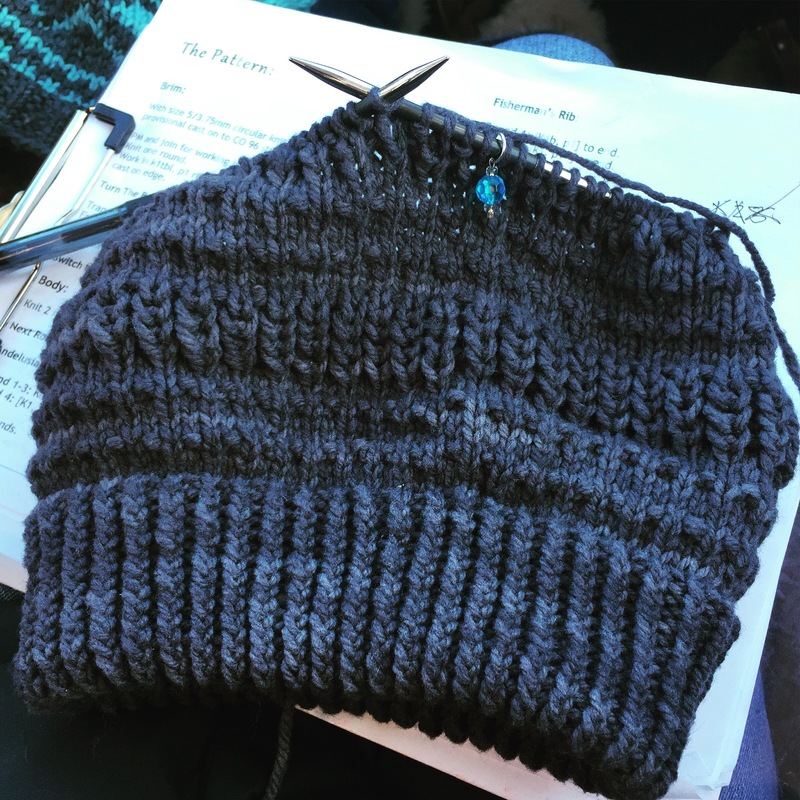 Finishing this Timber Bay hat shortly after arriving home. After so many miles, finally arriving back in Wisconsin and returning to our little house, as with all vacations that come to an end, it was bittersweet. We were happy to be snug & cozy with our familiar creature comforts. I was relieved that despite a week of very cold temps while we were away, the furnace was still working and the other car still started. In fact, everything was just as we left it. It felt a little strange at first, but I think that’s only because Yellowstone changed me. I feel a little braver. Maybe a little stronger. Most of all, though, my heart grew even more to recognize how incredible my little pack is — my husband for his planning, adaptability, unyielding search for adventure, and positive attitude, our children for their patience and ability to find fun in every darn place they are (including 20+hr car rides), and, of course, Moose for his unflappable calm and unrelenting zest for napping. It isn’t always easy or simple, but as long as we’re together we have everything that we need. WOW – nice write up – fabulous photos – that sunrise is award winning. And please add to your list of things your family has – beautiful and warm hats! I know the river wasn’t tempting to you, but how hard was it to convince your husband and kids not to try the river where boiling meets cold? When we were there, that was on our list of things to do, but it was spring and the water was too high, no swimming allowed. So glad you made it home safely to your snug little home in Wisconsin, the trip home sounds harrowing – did you do that drive all in one fell swoop, or did you break it into two days? 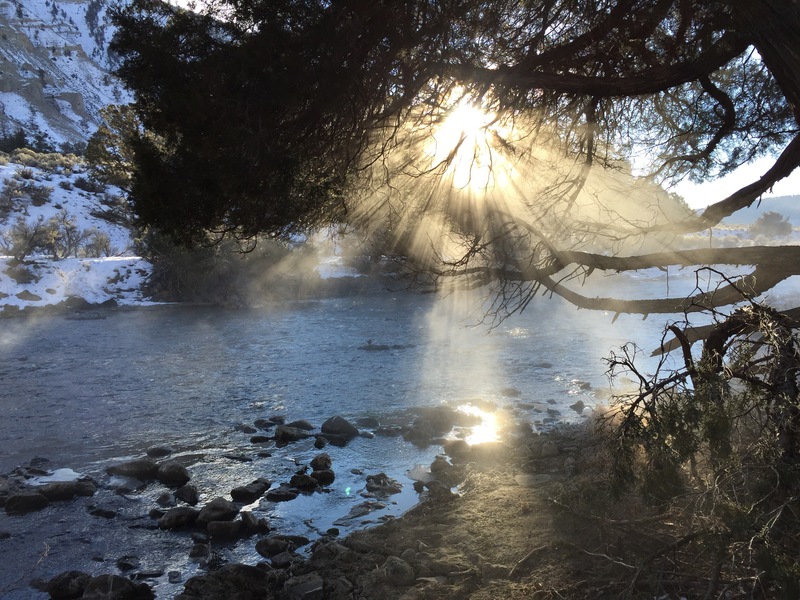 My husband was thinking of it beforehand, but after talking with some people who’d just stumbled out about having to wade through freezing to scalding to freezing over the rocky bottomed river just to find a spot that was good made him think twice. After his back problems last summer I think he thought the temp shocks weren’t a great idea. The kids weren’t interested thankfully – it was awfully cold! We broke it up into two days both ways – our house to Glendive, MT and Glendive to Gardiner on the way out & Gardiner to Fargo, ND and Fargo to home on the way back. The trip back is always the LONGEST though, no matter what! She scores all my best hats! That’s just the way of things around here. Yeah, I think it was mostly just going to be a lot of uncomfortable in exchange for a little bit of awesome. I’m glad he did not venture in this time. The extra hour or two the weather in Montana tagged on to day one was a little hard on everyone, but we made it in to our hotel early enough that the kids could swim and mister could hot tub while I dog sat. Poor Moose though – when we took him out in the -20 of Fargo for bathroom breaks he just looked at me like, “You have to be kidding me. This ground makes my feet hurt.” Poor guy! So glad you enjoyed these posts! 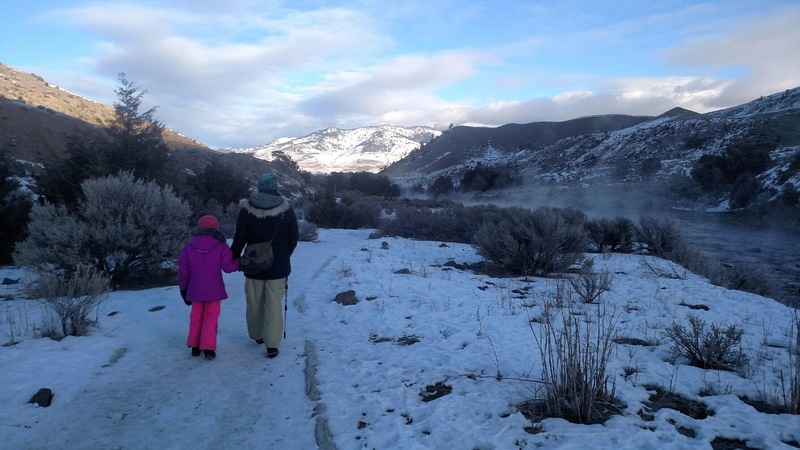 Definitely put Yellowstone in winter on your bucket list – you won’t regret it! Coincidentally, I have very fond memories of some solo time in the Green Mountain right after college. I really hope to get back to Vermont someday! Awesome! We were slated for a Glacier trip last year, but had to cancel when my hubby hurt his back. Hoping to make it next year! Enjoy! Your prose is only exceeded by your pictures, which are only exceeded by your knitting! I so enjoyed you taking us along on your adventure. You described the trip and your family so beautifully and lovingly that I felt like I was there. Thanks for sharing those wonderful moments. Thanks so much for your kind words! I’m glad you enjoyed! Such a great tribute to Yellowstone. I agree, Winter is such a magical time to see the park. It really is! We’ll have to return with tout the dog so we can enjoy some xxskiing sometime and get in to see the geysers! Thanks so much for your work – I can imagine it’s not an easy job, but know we really appreciate all that you and all those who work in the national parks do!